On each of 3 serving plates, arrange 5 banana slices in a circle, about 1/4 inch apart. Place strawberry slices, points facing out, over gaps between banana slices on each plate, to create a star. Spoon about 3 tablespoons yogurt in center of each star. Sprinkle pineapple over yogurt. 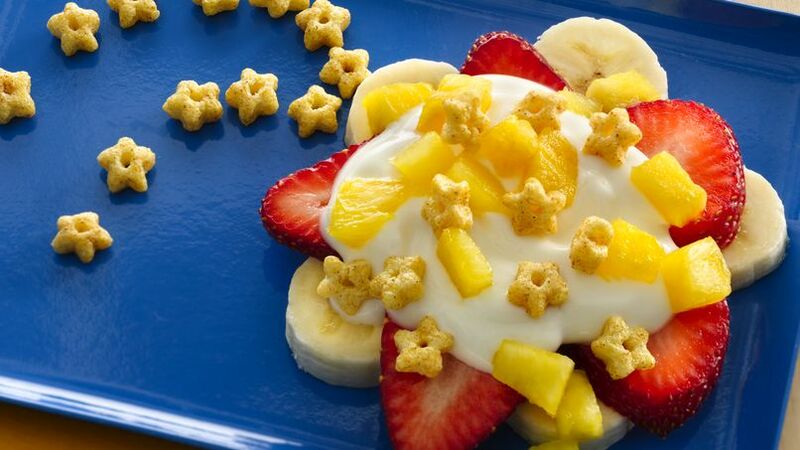 Arrange cereal on each plate to look like tail of shooting star; sprinkle remaining cereal over top of fruit and yogurt. Try substituting any flavor of Greek yogurt for the honey vanilla. A cookie scoop works great for spooning the yogurt in the center of each star. Your kids will love this fruit-filled breakfast inspired by Dora the Explorer™ star-shaped cereal.